Unable to wipe a smile from his face all week, Cole Hammer had to brush away a tear on Thursday as the 15-year-old from Houston prepared to tee off in the U.S. Open. Hammer’s big goal this summer was the U.S. Junior Amateur, but he tried to qualify for the Open on a lark. He wound up shooting 64-68 at Northwood Club in Dallas to make the field. So much for nerves, though. Hammer hit a gorgeous approach shot into the 10th, his first hole of the day, and barely missed the birdie putt. He tapped in for par. Hammer is the third-youngest player to qualify for the U.S. Open. Andy Zhang was 14 in 2012, and Tad Fujikawa was 4 months younger than Hammer when he qualified in 2006. 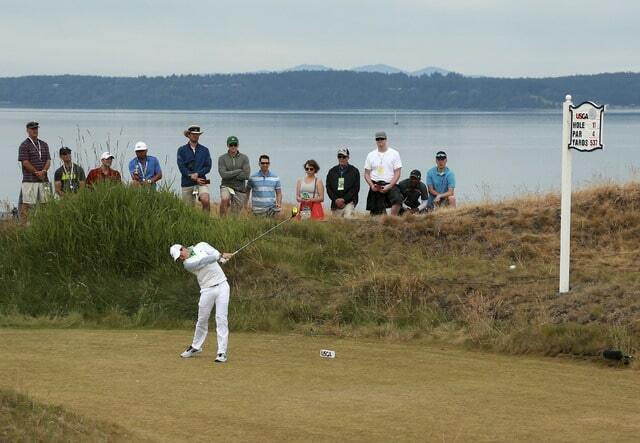 Phil Mickelson was among the first players to embrace the quirks of Chambers Bay. No wonder: He’s already in red figures. The six-time U.S. Open runner-up birdied two of his first five holes Thursday, quickly moving to the top of the leaderboard. Mickelson also hit a sweeping draw out of knee-high fescue at the par-4 fourth hole, eventually making par out of a tee shot that could have been much worse. Henrik Stenson later joined him at 2 under. Rory McIlroy, defending champion Martin Kaymer and a group of Dustin Johnson, Adam Scott and Sergio Garcia are also on the course as the last of the morning wave begins. Don’t look over your shoulder, Phil. WALL-E is right on your heels. A four-wheel robot with a camera strapped atop that bore a striking resemblance to the robot from the animated film followed Phil Mickelson’s group at Chambers Bay on Thursday. Mickelson better not look up, either. As part of its pitch to acquire the U.S. Open, broadcaster Fox promised innovation. So while they had yet to take flight, drones are expected to soar over the links-style course this weekend, giving viewers at home a hawks-eye view of the action. No word on whether Skynet will be handling its controls. One of the big questions players had about the U.S. Open this week is how Mike Davis, the USGA executive director responsible for setting up Chambers Bay, would lay out a course with seemingly infinite possibilities. Davis chose to play the first hole as a 496-yard par-4, rather than a 598-yard par-5. He made the 18th a 604-yard par-5 rather than a 525-yard par-4. With dozens of tee boxes at his disposal, Davis can play around with the other 16 holes, too. The par-3 ninth can play steeply uphill or with a 100-foot drop to the green. Oh, and that first hole? Only two players birdied it during stroke play at the U.S. Amateur in 2010. Bubba Watson made double bogey there to start his championship Thursday. With calm breezes blowing off the Puget Sound, the U.S. Open began Thursday when Michael Putnam teed off at Chambers Bay south of Seattle. It won’t take long before the big names get going. Perennial bridesmaid Phil Mickelson, with another chance to finish a career grand slam, is in the fourth group with Bubba Watson and Angel Cabrera. A short while later, Rory McIlroy begins his round on the back nine in a group that includes defending champion Martin Kaymer. Tigers Woods, Masters champ Jordan Spieth, Rickie Fowler and Jason Day are among those who will start in the afternoon, when the tournament goes to prime time on new broadcaster Fox.